I tend to forget things I’ve ordered online, so it’s always a nice surprise receiving my packages at work. It’s even better when I know there’s food inside! I recently subscribed to the meal kit service by Plated. They were offering four free plates for new members at the time, so I figured why not try it out. I kept my subscription because most of the recipes are foods that I wouldn’t think to look up myself and I love the convenience of having all the ingredients delivered to me in exactly the quantities I need. You’ll probably see some of my Plated meals posted here, at least when they turn out well! 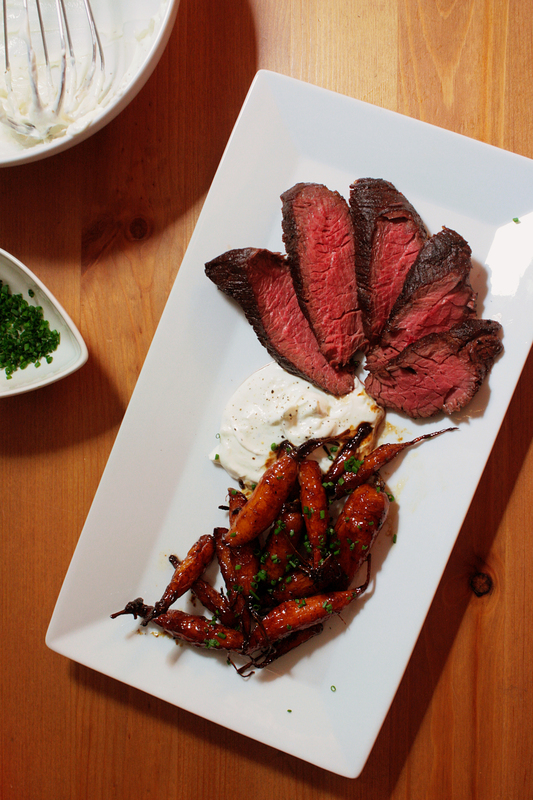 I love my steak, so when I saw Hanger Steak with Sweet and Sour Carrots on the Plated menu I had to order it. 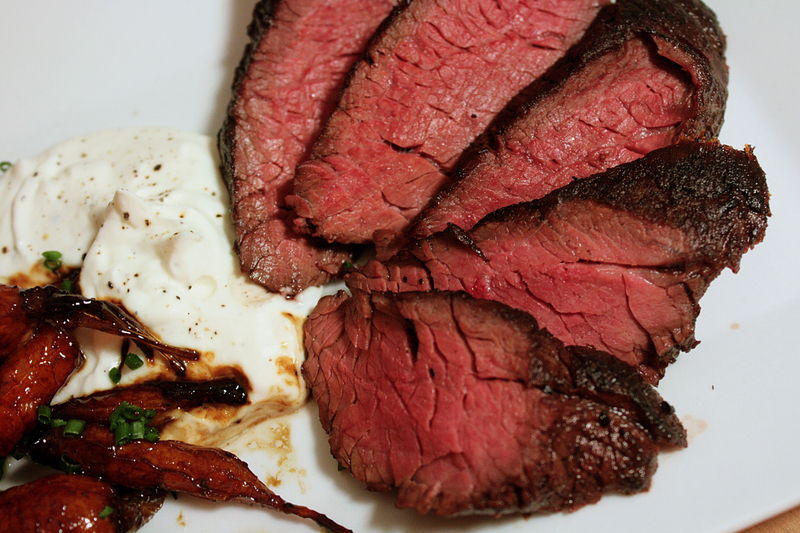 The steak itself needed very little prep. Just season it with some salt and pepper, then sear off all sides in a pan, cook until it’s the right firmness, let it rest for 10 minutes, and cut against the grain. Once you figure out how firm it should feel to come out medium, it’s super simple and delicious. This is why I love steak! Sweet and sour glazed carrots. Doesn’t that just sound bougie to you? 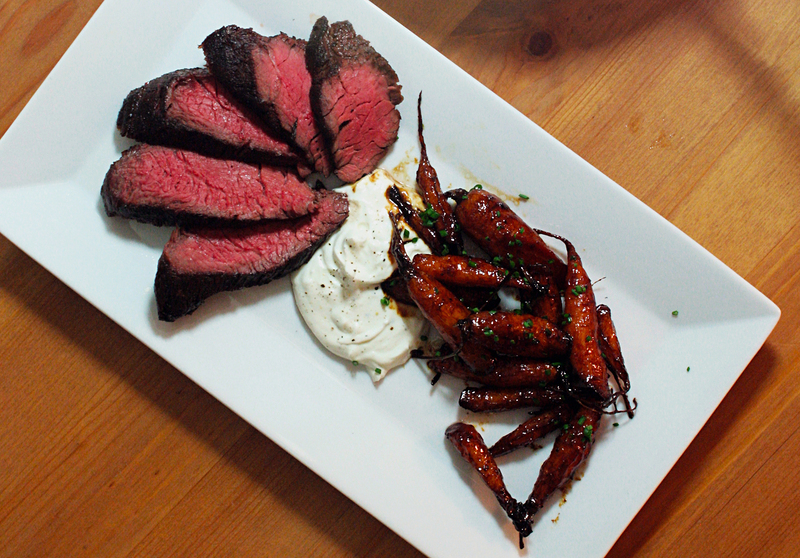 I hadn’t tried cooking carrots like this before, and I think they turned out amazing. They were tender and the glaze was perfectly sticky, with a honeyed sweetness. I added a little bit of syrup to help speed up the caramelization, but aside from that I pretty much followed the Plated recipe card. 1. Cut carrots in half, with a deep diagonal. Thinly slice chives. 2. Add carrots, red wine vinegar, honey, butter, and 3/4 cup water to a large high sided pan over medium-high heat. Season with salt and pepper. Cook covered until carrots are tender, around 10 minutes. 3. Increase heat to high, stirring occasionally. When most of the liquid has evaporated, add syrup. 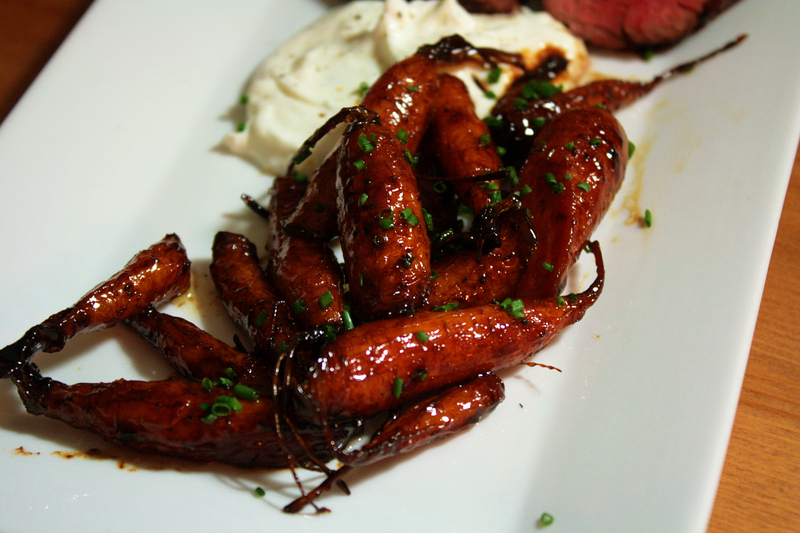 Continue cooking until carrots start to caramelize. Don’t panic when it starts to bubble. It’s supposed to do that. 4. Remove from heat and add 1 tablespoon of water. Shake pan and stir to coat carrots in glaze. 5. Finally, portion them out and top with chives. Enjoy delicious carrot-y goodness. this looks phenomenal i might just have to try that plated thing!